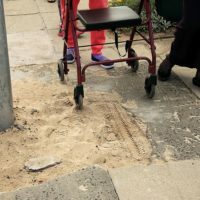 There has been slight improvements since then, but accessibility still remained a huge concern for MID once we started paying greater attention to how environmental design disable residents and visitors through inaccessible public spaces. Limiting access to public recreational facilities and centres. Also, the Believe in Schatzi Organisation (BISO), through their on-going advocacy and awareness raising, positioned Muizenberg beach as an inclusive surfing destination, offering adaptive surfing to children and adults of varying “differabilities”. MID, together with BISO, resolved to motivate and encourage the City to consider Muizenberg as a Universal Accessibility (UA) upgrade project. It is, after all, a recreational destination for families with young children in strollers, for disabled persons and home to many residents in frail care/homes for the aged where mobility is dependent on various assistive devices. It is however only in early 2016, after a site meeting with the City, where referrals to the TDA’s Non-Motorised Transport and Universal Accessibility’s department made UA for Muizenberg seem like an achievable objective. On 20 April 2018, the City’s TDA NMT/UA Department presented their Muizenberg UA assessment feedback at the sub-council 19 meeting. A significant milestone for the area with draft UA plans that will see this project realised in a phased process pending the availability of funding. Improved access through environmental design! We thank Ashtan Davids from Believe in Schatzi Organisation and Adaptive Surfing Initiative for his tenacity in highlighting how disabling environmental design can be.